When you work in the aggregate industry, you know that there are a wide variety of crushing applications that require replacement crushing solutions. Samscreen offers a variety of replacement parts for crushing applications, so that you’ll always have the right part for the job. Whether you’re in the business of crushed stone, gravel, mining, quarrying or any other number of aggregate applications, Samscreen is sure to have the crushing solution for you and your business. 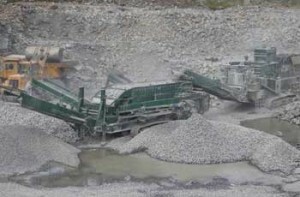 Samscreen provides the perfect solution for any number of crushing applications. When you choose Samscreen to meet your replacement crushing parts needs, you’ll find that we offer specialized solutions for many different crushing applications. Our top priority is to make sure our customers are provided with high-quality crushing products with a short turnaround time. That means that no matter what the application, Samscreen can help you solve any crushing concern and get back to the job as soon as possible. To find out how we can provide a custom solution for your crushing application today, simply call us at (888) 344-3653 and we will be happy to assist you with your replacement crushing and wear part needs.